There is a very unique challenge concerning how to manage the effects of aging and its impact on musculoskeletal well-being and continued participation in sports-from the weekend to the master athlete. As the majority of patients I see come for impairment of the knee, that will be the subject of this Blog. No matter which joint though, the major problem as we age is weight gain despite a high level of activity and the same nutritional patterns as when we were younger. One must be aware that the body’s Resting Metabolic Rate (RMR) comprises 60-75% of daily energy expenditure and that RMR decreases 20% from childhood to retirement. So too, just as there is a tendency to gain weight, there also is the reality of continued loss of muscle mass with aging. Even if your weight remains unchanged, your percent body fat will increase. If you don’t believe me, take your clothes off and look in the mirror. To make matters worse, joint cartilage doesn’t physiologically reproduce after age 40, so whether it be genetically programmed or from injury, the cartilage loss is historically irreversible. All bad news so far about athletics with aging but the vicious cycle can be broken. First of all, try to be as thin as possible while still maintaining good health. Second, you need to strength train in addition to aerobic and anaerobic conditioning. That’s where cross training is exceedingly helpful. When your knee hurts, water based exercising is the fix. When you can’t run, biking is the approach. From my perspective, when the over the counter analgesics and anti-inflammatories aren’t affective, the first line of approach is an intra-articular cortisone injection coupled with a prescription for an anti-inflammatory and physical therapy. Bracing is beneficial starting with an over the counter support. Also consider an orthotic in your shoe to level your running and walking and thereby correct force transmission to the knee. The next step in magnitude for the arthritic knee is the unloading brace (orthotic) with or without the electro-stim adjunct. If the intra-articular cortisone injection benefit lasts four months, it may be repeated a total of three times in a year. If not, visco-supplementation is the next option. This injection of hyaluronic acid has proven very helpful in managing knee arthritis. The latter series of injections may be repeated twice a year at six-month intervals. While five years ago, the visco-supplementation series required up to five injections per series, now the demand is one to three visits owing to advances in science. OK, you have done all these things and the pain and impairment relief are no longer affective, now what? Platelet Rich Plasma is the latest and maybe the greatest; we shall see. My colleagues and I are using PRP with early very positive early results. Caution, up until the usage of Platelet Rich Plasma, treatments were covered by private indemnification and Medicare either all or in part. PRP is an out of pocket expense. Naturally, the final step before a joint replacement will be stem cell based and we’re working toward that end. If you can’t wait, have a total knee replacement; there are inherent risks that are permanent so be a well-informed consumer. 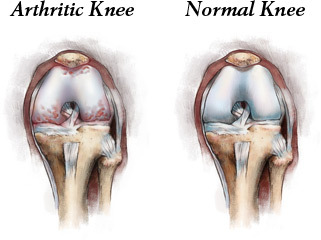 If you are able to wait, take my prescription and follow the algorithm for TREATING KNEE ARTHRITIS VIA JOINT PRESERVATION AND REGENERATION.